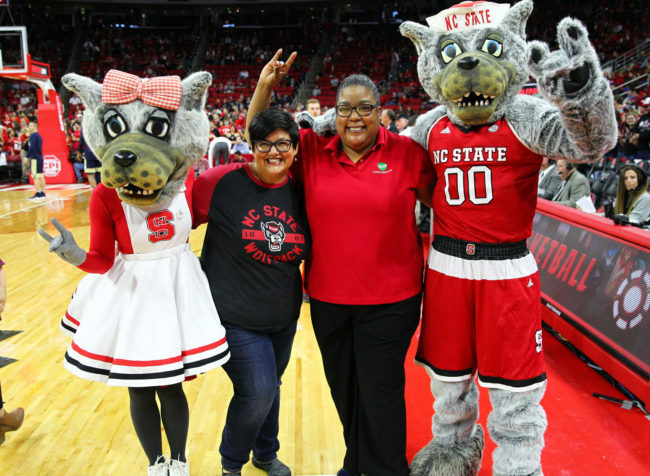 The two 2018-19 Kenan Fellows hosted by North Carolina electric cooperatives were recognized for their exceptional achievements as educators at last Saturday’s N.C. State basketball game against ACC rival Pitt. 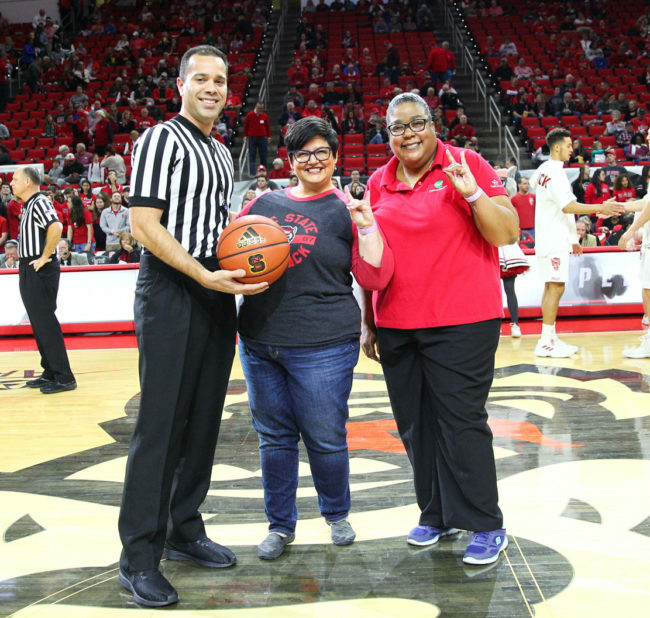 Kari Cobb of Northside High, hosted by Jones-Onslow EMC in Jacksonville, and Daria Fedrick of Bragg Street Academy, hosted by Central Electric in Sanford, were recognized on the court at PNC Arena. 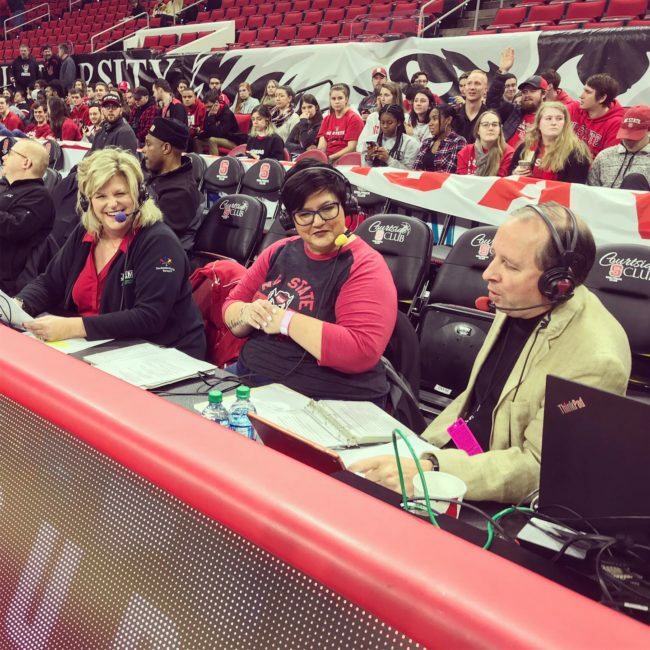 A pre-game interview also highlighted the partnership between the Kenan Fellows Program for Teacher Leadership based at N.C. State University and North Carolina’s electric cooperatives, and the many opportunities the program provides for educators, businesses, students and local communities. Kenan Fellows Kari Cobb (left) and Daria Fedrick (right) served as the game ball presenters. With the goal of bridging STEM (Science, Technology, Engineering and Math) at work with STEM at school, the program offers fellows the chance to spend time at their local electric co-op to learn firsthand how co-ops operate and deliver power to their members. The fellows then take the real-world experience and knowledge they gain back to the classroom to energize students, reinforce STEM principles and build awareness of local career pathways in the energy field. Kenan Fellow Kari Cobb and her mentor Paula Redick, JOEMC’s assistant vice president of community and public relations, participate in a pregame interview highlighting the co-ops’ partnership with the Kenan Fellows Program. North Carolina electric cooperatives have sponsored and hosted six educators as Kenan Fellows since 2014. Applications are currently being accepted from educators in Cabarrus, Mecklenburg, Rowan, Stanly and Union counties for a 2019-2020 fellowship at Union Power Cooperative in Monroe. Interested educators can learn more and apply at union-power.com/kenan-fellows. The application deadline is Jan. 21, 2019. To find out more about the Kenan Fellows Program, visit the In the Community section of our website or kenanfellows.org.